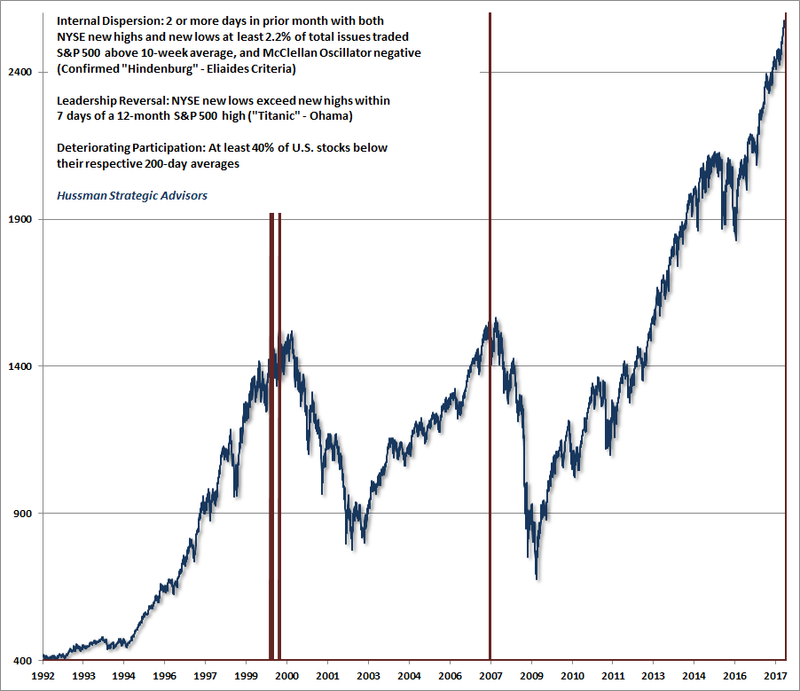 I’ve noted over the years that substantial market declines are often preceded by a combination of internal dispersion, where the market simultaneously registers a relatively large number of new highs and new lows among individual stocks, and a leadership reversal, where the statistics shift from a majority of new highs to a majority of new lows within a small number of trading sessions. Just a brief comment on market action. On Tuesday November 14, the number of NYSE stocks setting new 52-week lows surged above the number of stocks setting new highs, with both figures representing more than 3% of total issues traded. This “leadership reversal” joins the deterioration in our own measures of market internals last week, as well as ongoing dispersion in market breadth and participation. As noted in the chart below, this couples a “Hindenburg” with a “Titanic,” and is actually the first time since July 2007 that we’ve seen this particular combination of internal deterioration. Each of the red bars below was also associated with unfavorable market internals on our own measures. While the names of these indicators may seem silly and overly menacing, they actually get at something very serious. They capture situations where the major indices are near new highs, yet market internals show much greater divergence. In my view, this type of market behavior is indicative of a subtle shift in the preferences of investors, away from speculation and toward risk-aversion. Coupled with the most extreme “overvalued, overbought, overbullish” syndromes on record, the behavior of market internals warrants close attention. Credit spreads are also worth monitoring, as junk bond yields have surged in recent days. Importantly, we always have to allow for the possibility that market internals will recruit fresh strength. Our measures of internals reflect current, observable conditions, and suggest increasing investor risk-aversion, but this deterioration is not a “lock” on a negative outlook. We’ll take the evidence as it arrives, but today’s leadership reversal seems worth noting in the context of the other internal deterioration we’ve observed in recent days. Though I wouldn’t take the 3 consecutive signals last week as a compelling warning in themselves, I do think they deserve mention because they are occurring so close to unusually overvalued, overbought, overbullish conditions that independently warranted concern last week. With regard to our own measures relating to new highs and new lows, we observed a ‘leadership reversal’ last week – a sudden flip from new highs dominating to new lows dominating, with significant numbers of both, within a few days of a market peak. Those reversals are generally a signal that there is an underlying “turbulence” in market internals, which is a symptom of increasing skittishness by investors.